GOT STUFF ??? Donate it to a local nonprofit and a really good cause! Profits benefit DASI services for victims and survivors of domestic and sexual violence and their families in Sussex County. SHOP LOCAL!!! Shopping at Morning Glory saves money and supports a great cause! (If we do say so ourselves!) 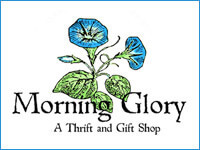 And, at Morning Glory you can find most anything – furniture, clothing, jewelry, home decor, books, shoes, handbags, antiques, art, and lots of miscellaneous. Donate your gently used items!! Non-upholstered furniture, antiques, washed or dry cleaned clothing, outerwear, shoes, accessories and jewelry; household and decorative items, kitchenware, lighting, linens, curtains and drapes; clean/functional tools, garden and outdoor items; artwork; art, craft and hobby supplies; musical instruments, and select music, books, and movies. Just ask if it’s not listed! CDs/cassette tapes/VHS tapes, mattresses/pillows, single or souvenir mugs and glasses. 134 Main Street (Route 206), Andover Borough Wednesday-Friday, 11am-5pm, except the first week of the month. To arrange a pick-up or drop-off appointment, please call 973-786-0018 or email mgshop@dasi.org. Interested in being a part of a fun vintage and resale store? Volunteers are needed for a variety of projects! For more info, or to volunteer, contact us today!